A septic tank is installed underground to collect sewage from a property that is not connected to the public sewer network. 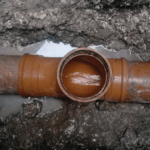 Once in the septic tank, sewage separates naturally: solids settle to the bottom, fats form a scum on top, and the relatively clear effluent liquid stays in the middle. From there, the liquid discharges to ground from the tank, leaving natural bacteria to process the solids into sludge. The sludge waste needs to be removed from the tank by a specialist operator (like UKDN Waterflow) at intervals according to tank capacity and volume of wastewater. For a diagram and further details, see our septic tanks page. From 1 January 2015, new installations of private sewer systems (septic tanks) must not discharge directly to a watercourse. By 1 January 2020, all existing septic tank installations must either output to a drainage field (built to relevant BS standards), or be replaced by a sewage treatment plant (also known as a package treatment plant). But, if you plan to sell the property before 1 January 2020, you have to carry out the replacement or create a drainage field before you sell. If you are the person responsible for a septic tank — known as ‘the operator’ — there are rules you need to follow. These guidelines, set by the Environment Agency, cover everything from the way a septic tank works, to the British Standards in force, correct installation, discharging to ground, pollution implications, emptying, maintenance and when you need a permit. You will find full details of the general binding rules on the government website. With the changes to septic tank legislation, before buying a new property, or simply to establish the condition of an existing tank, it is worth having a survey. This will show the condition of the tank and identify any potential problems. Ask us for a quote on 0333 344 2937 or complete the contact form. Part of your responsibility as the operator of a septic tank is to ensure that it functions as it should. That means making sure it does not cause pollution incidents. It also means having accumulated sludge pumped out by a registered specialist waste handler and the tank cleaned to keep it flowing freely. You should also take care not to upset the eco balance of the septic tank by using chemical cleaning products, or by putting forbidden items down the drain. Septic tank maintenance can be pre planned through UKDN Waterflow, so that we will visit at a time to suit you, carry out the work and complete all the necessary paperwork — all automatically. It’s one less thing for you to worry about. Ask for more details about our septic tank services on 0333 344 2937. Visit https://www.gov.uk/permits-you-need-for-septic-tanks/overview, download our septic tanks tip sheet, or visit our septic tanks: facts and legislation page.